Durga Pooja is one of the major festivals of Bengalis and celebrations last for five long days. Bengalis all over the world celebrate together this day getting together with friends and relatives. The first day of Durga puja known as Sapthami begins with the predawn bathing and commencement of rituals. Godess Durga is welcomed with a lot of celebrations on the sixth day which is known as Sasthi. The most important day is Ashtami, the day on which Durga’s victory over Mahishasur is celebrated. At the end of Ashtami and the beginning of Nabami falls Sandhi Puja, which is when Devi Durga transformed into Devi Chamunda to slay two evil demons. The last day of the pooja, Nabami takes place after Santhi puja. On this auspicious day the Nabami Bhog is organized by offering food to Godess Durga which is later distributed among devotees. Dashami is the last day of the celebrations and Bengalis mark an end to the celebrations by immersing the clay idol of Durga in the sacred Ganga and hoping to see her again the next year. On Durga Puja, you can hold a lot of celebrations inviting family and friends from far and near. Inviting everyone can be quite a hectic task and it would be best to use online invitation via Yoovite.Com. With this, you can simply choose the best template from the list, enter the details like venue and time and send it at the same time to all you wish to send to. 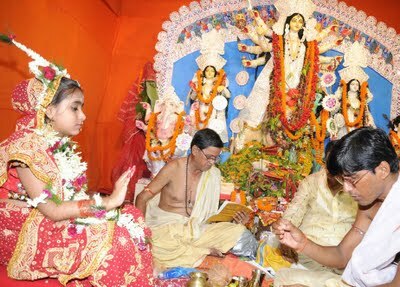 The main attractions among the preparation for Durga Pooja are making of idols and the making of the puja pandal. 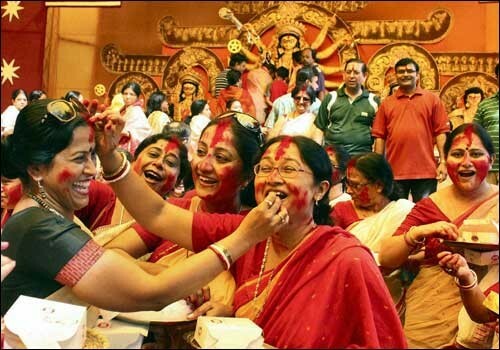 Bengalis get busy preparing for welcoming their friends and relatives, give away gifts and to prepare delicacies. They redecorate their houses, purchase clothes and plan out for the four days to come. Being the most popular festival of Bengalis, sales, discounts and free gifts are offered by all shops in the city. To this fun and frolic Yoovite brings to you the convenience of inviting your near and dear ones with durga puja online invitation just as simple as you used to send e-cards for durga pooja.